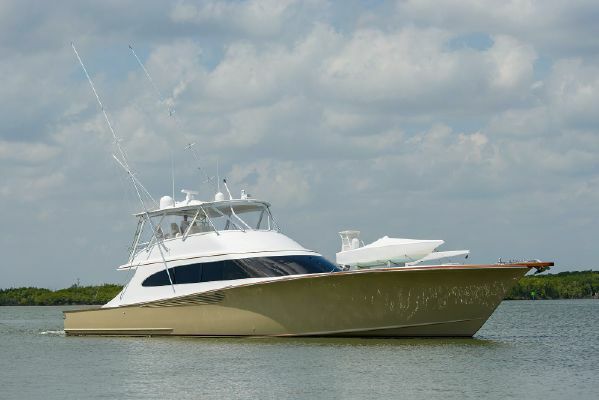 87' Custom Sport fish yacht. 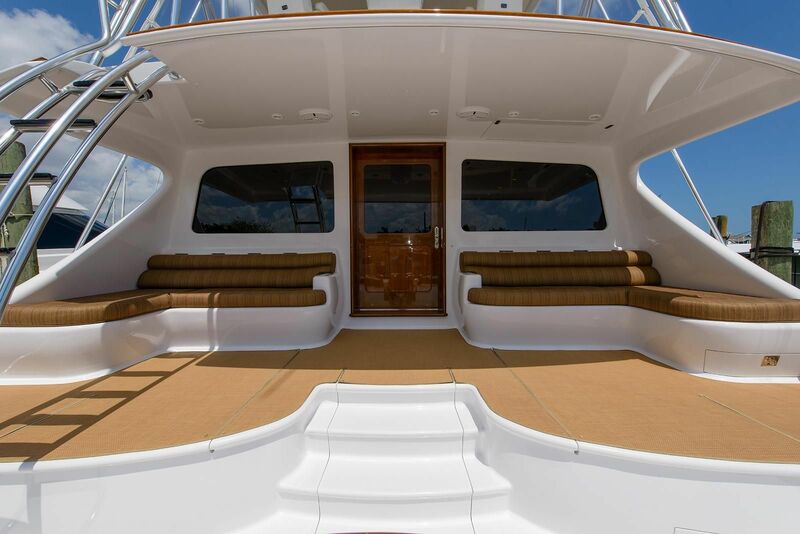 Specner 2014 You can cruise at 40 knots, or at 20 have a 1000 mile range. 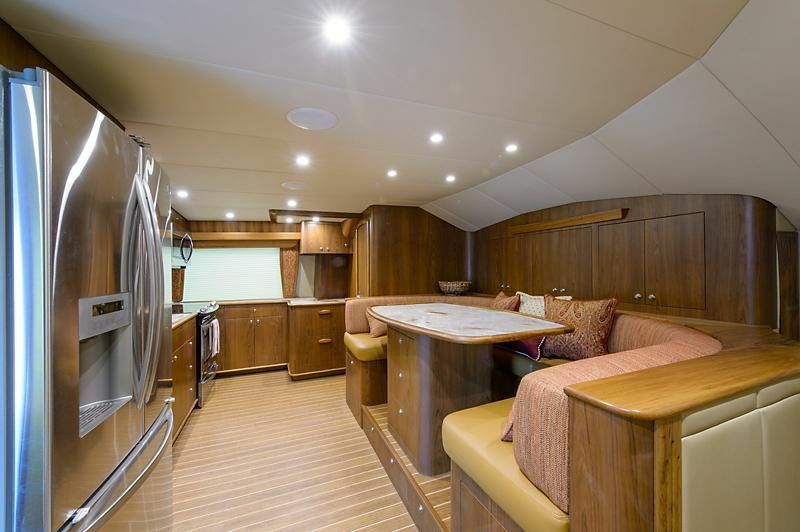 87′ Spencer Sport Fish piece of Art. 2014. 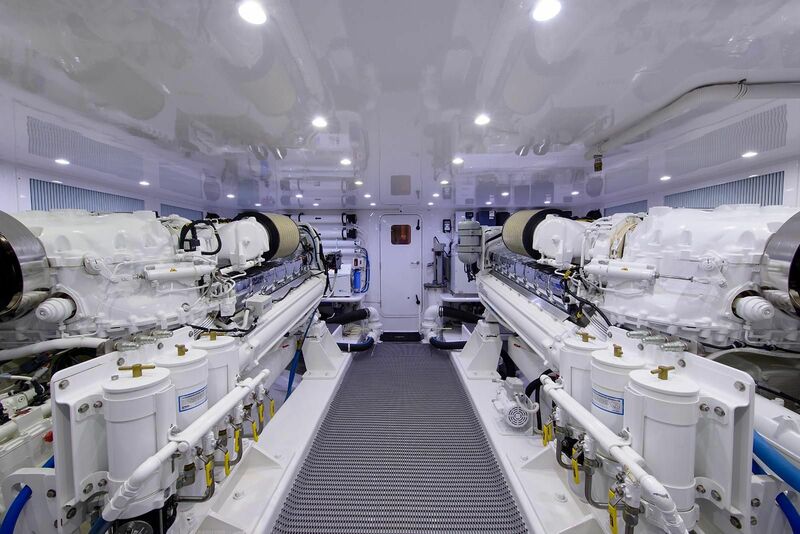 LOA: 87′ Beam: 20′ Draft: 4’10” Displacement: 140,000lbs Fuel: 4,400 Gallons Water: 360 Gallons. 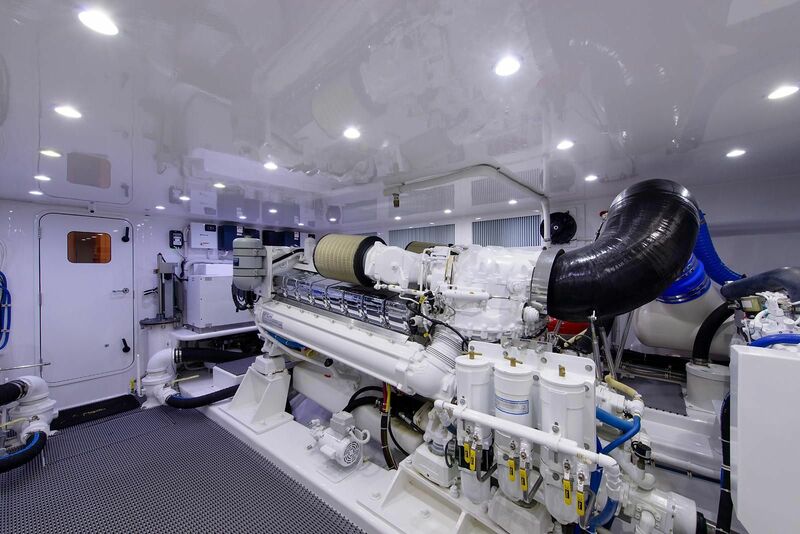 With fuel capacity at 4,400 gallons, using the number of 4,200 usable gallons of fuel, @ 33kts the burn would be between 150-160 gph, or 25-26 hours (750-800 mile range) @ 33 kts. Top end speed, wide open throttle at 45-47 kts, fuel burn will be about 280 gph. Once underway, the 87 becomes even more impressive. She slips onto plane with ease, and at 1,195 rpm, she lopes along at 18 to 19 knots burning 48 gph. This improves long-range -traveling in that you can make some time and you are not at a super high burn rate. 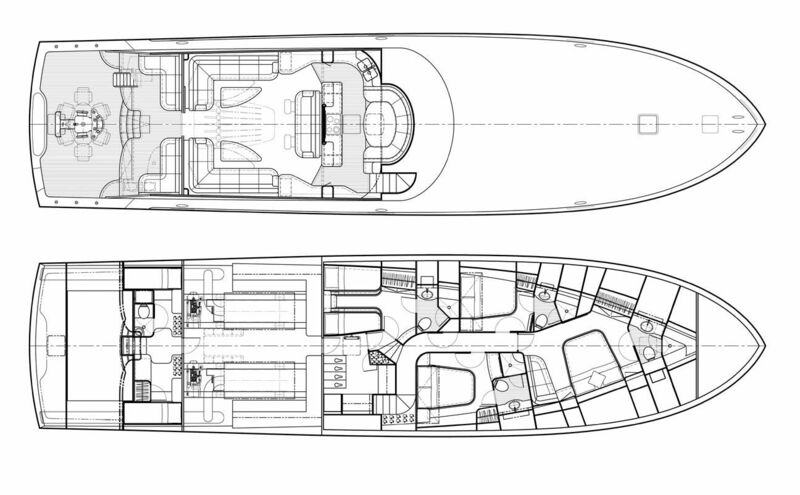 Spencer increased the depth of the propeller pockets in the hull to reduce the shaft angle to less than eight degrees for a more efficient ride. When you push her up and give her fuel, she carries the mail. She feels smooth and reacts to the trim tabs well. Running along at 1,650, she’ll make 28.5 knots while burning 122 gph; at an 1,850 rpm cruise, the 87 reaches 32.3 knots while burning 162 gph. 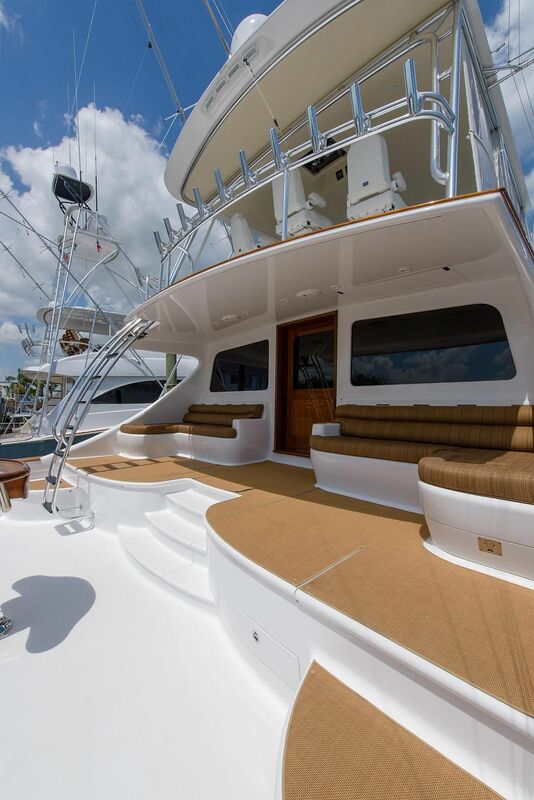 Wide open, the 87 hits an impressive 42 knots, but she’ll burn around 270 gph at that speed. 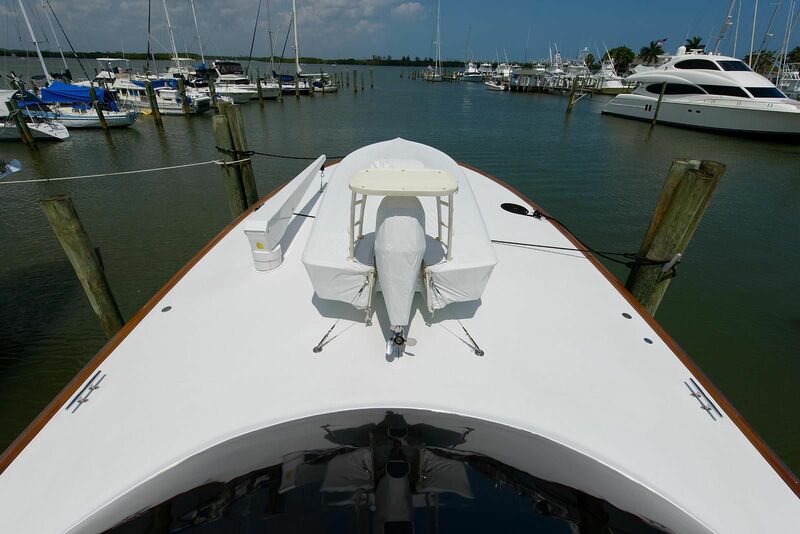 She trolled clean and can spin within her own axis, and the boat backs down easily without wanting to bury her transom. Paul Spencer and his guys have had a huge impact on Carolina boatbuilding ever since their very first hull. 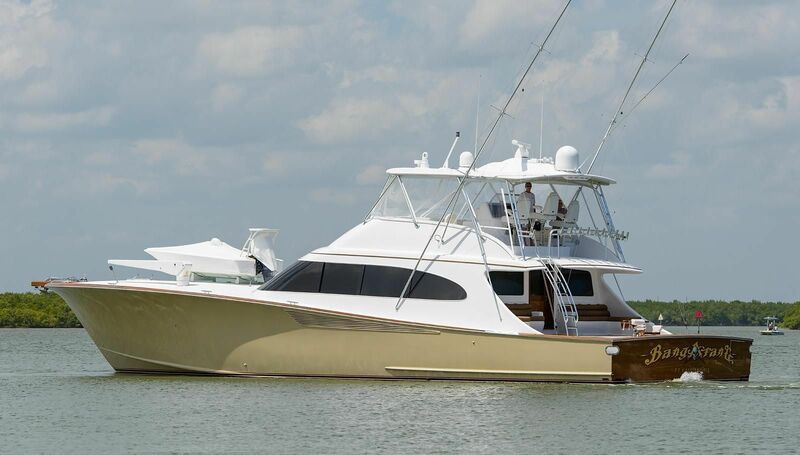 With their impressive number of tournament wins and their reputation for building finely styled boats that run great in rough water, it’s no surprise this new 87 is a solid performer. 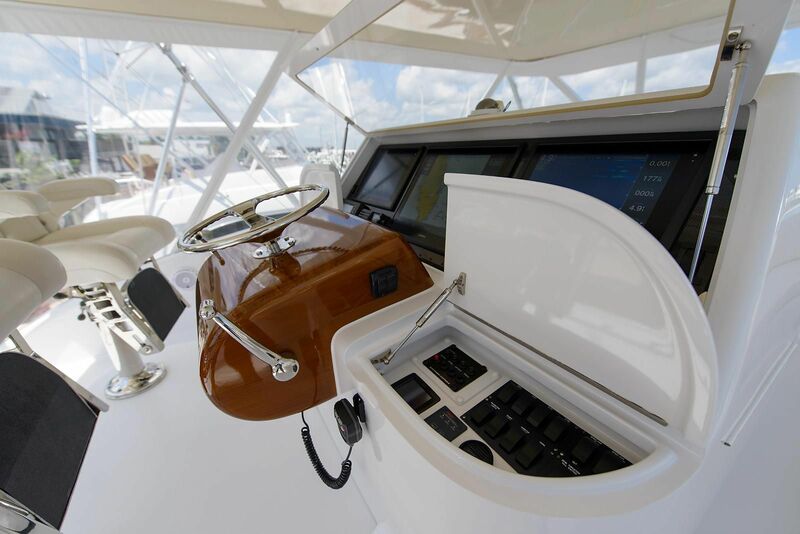 The cockpit offers a fishing -platform, which should be the envy of anyone who drops a bait in the water. 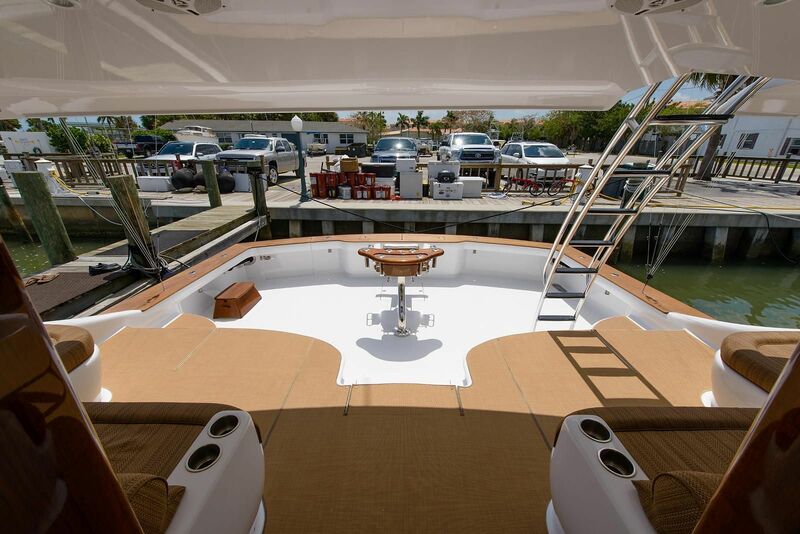 Highlights include a transom fish box large enough to hold several large tuna and a heap of bottomfish, as well as a walk-through transom door. 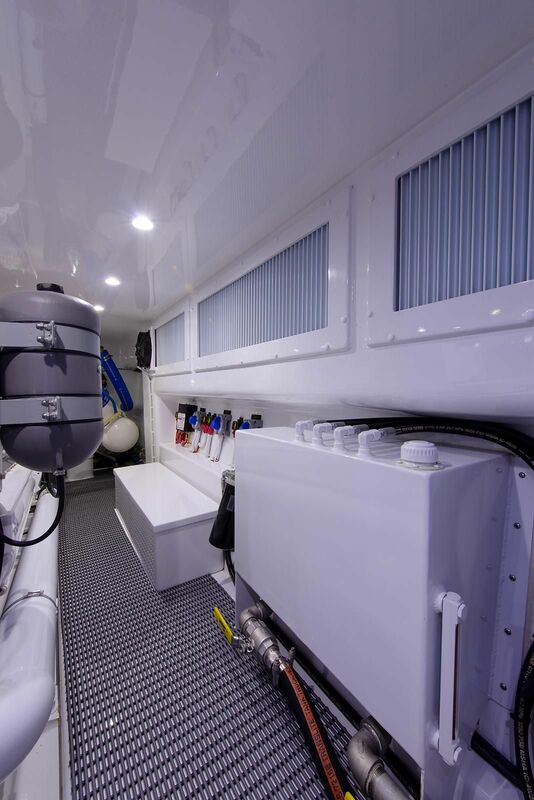 Storage bins under the gunwale hold gaffs and mops, and there’s also tackle storage, freezers, bait coolers and drink boxes. 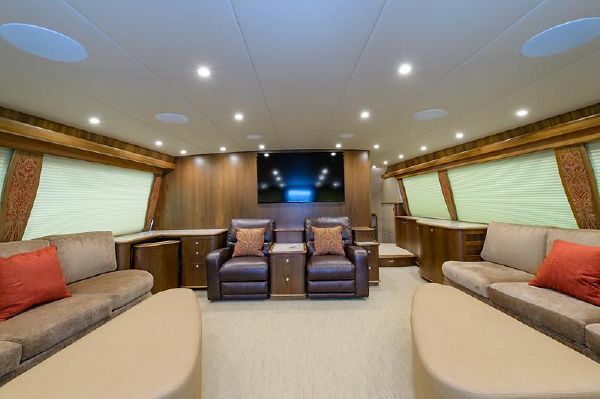 The expansive mezzanine has two large molded-in L-shaped lounges with air-conditioning dumps over the backrest, freezers under both seats, a pullout grill on the starboard side, and a drop-down flat-screen TV to keep guests up to date with the play-by-play from the game of the day. 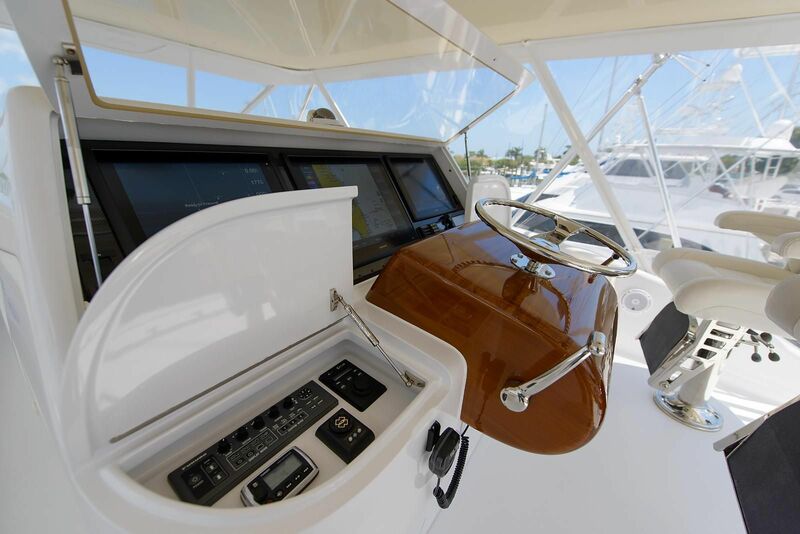 The layout on the flybridge of the 87 features a center console with three multifunction screens in the dash; radios, switches and other gear are -hidden in bins on either side of the helm. 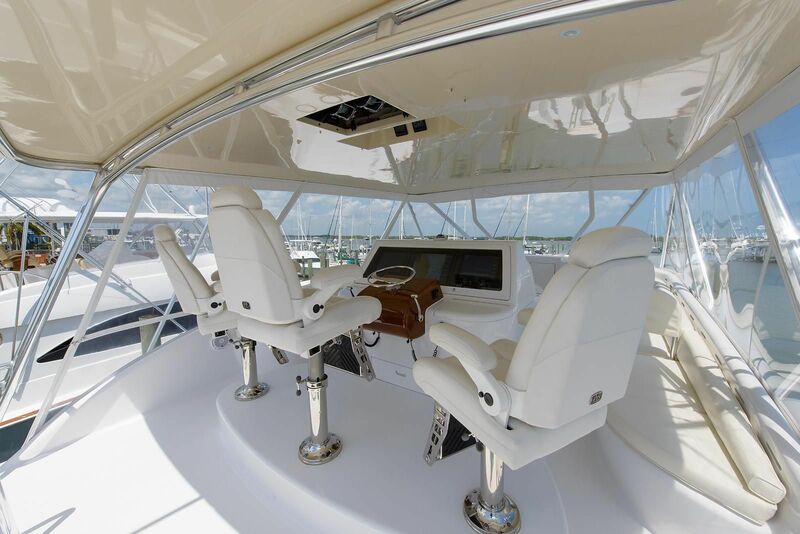 Three helm chairs come aligned behind the console and offer great visibility all around the boat. 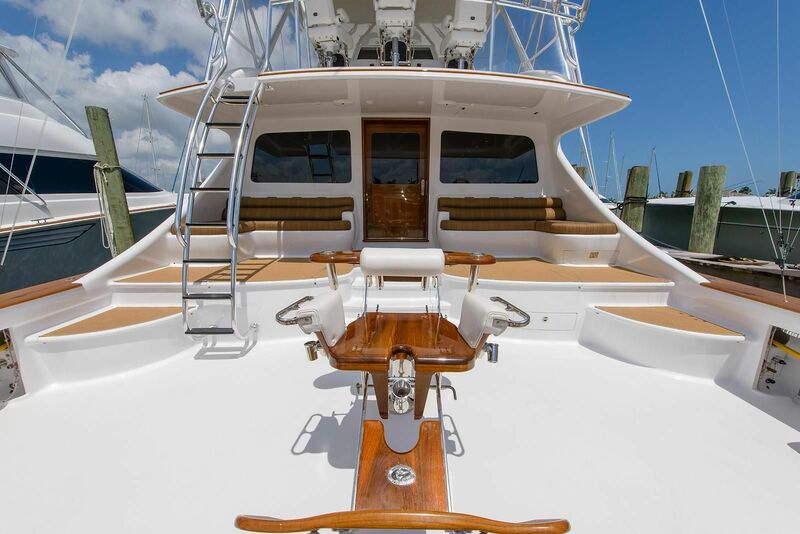 From the helm, you can easily see the bow and the transom corners, as well as most of the cockpit while fighting a fish. 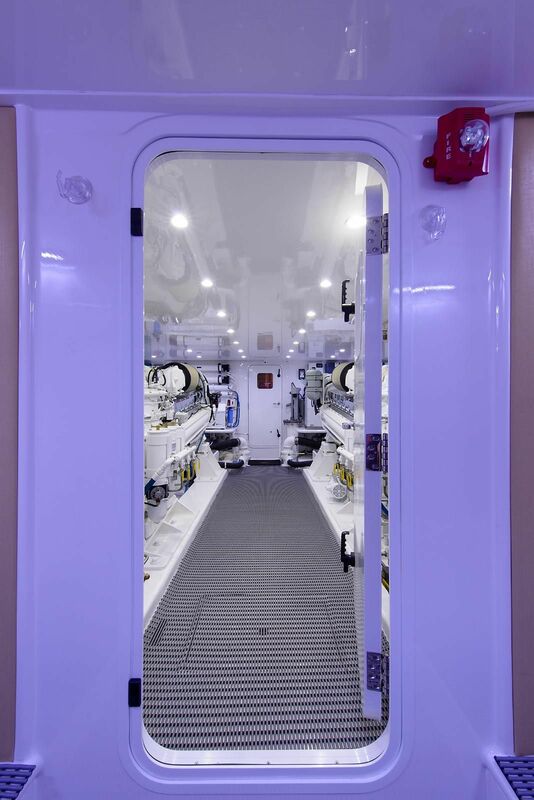 A fully cushioned layout lounge in front of the console has storage underneath that houses PFDs, cockpit covers and other gear. 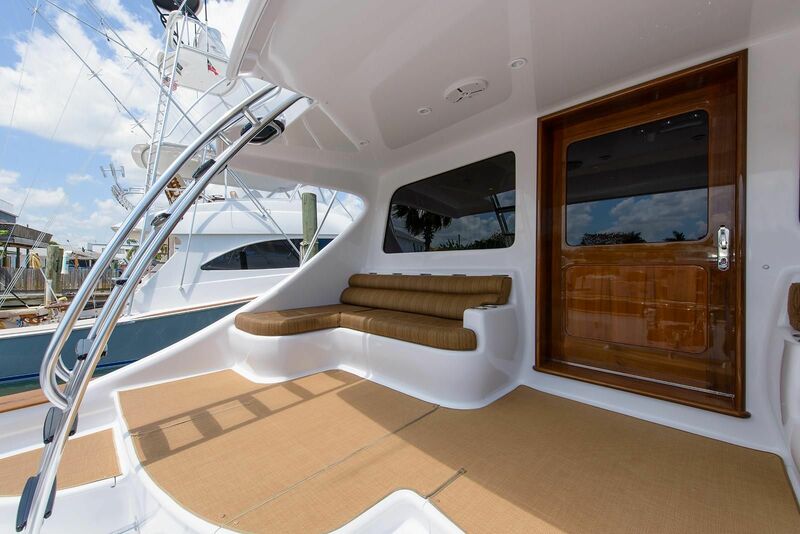 Along each side of the bridge, long wraparound bench seats with storage underneath provide comfortable seating for guests. 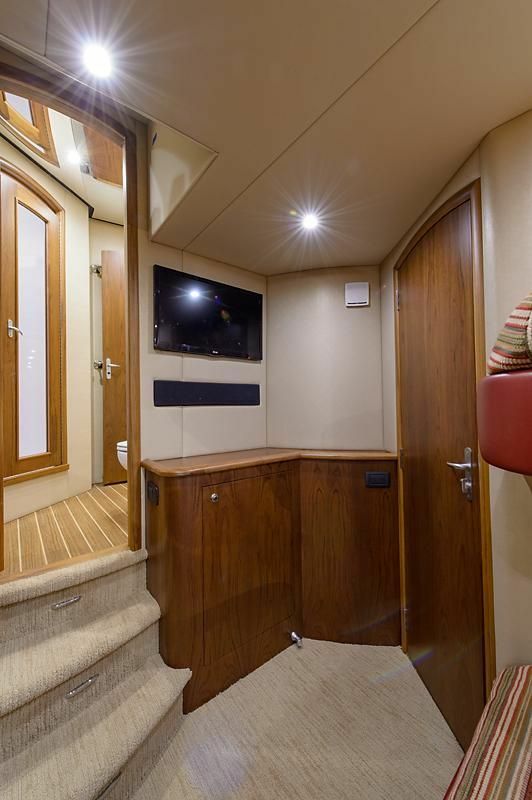 Guest VIP with Walk-around Double Berth, Pullman berth and Head. Stateroom with four (4) berths on port side. 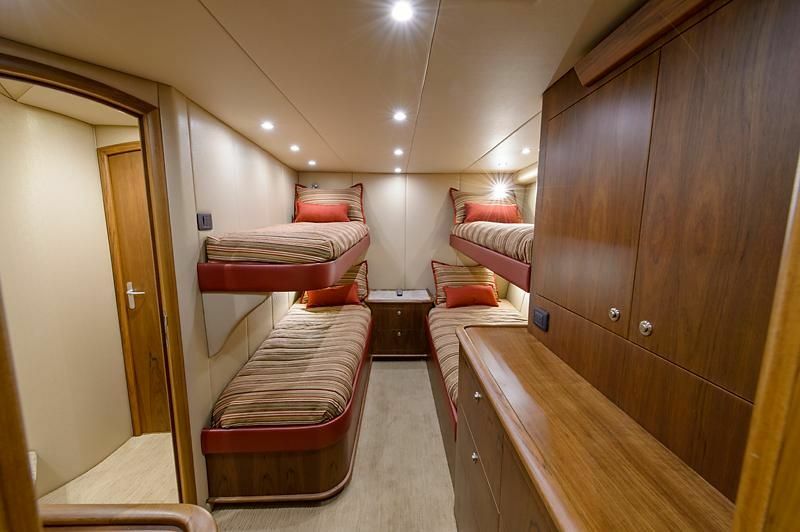 Stateroom with large (double) berth lower and single upper berth. 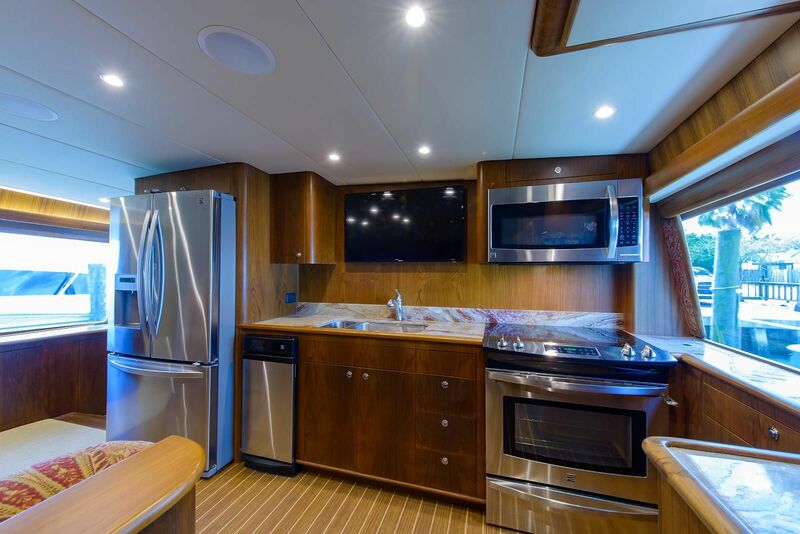 A Galley Like Home Forward of the bulkhead along the starboard side, you enter the full-beam galley with a stand-up refrigerator amidships, counter space with storage underneath, yet another big flat-screen TV overhead, and the full oven, cooktop and microwave oven outboard to port. 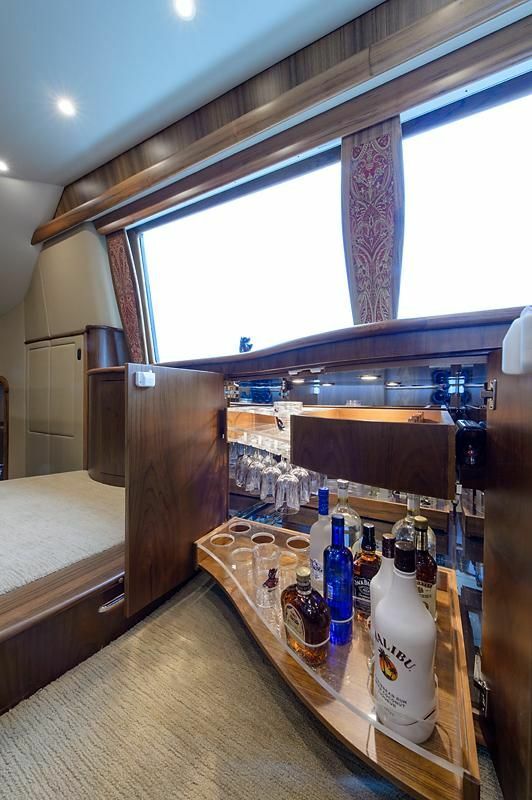 Built-in refrigerator drawers with counter space over them lie along the port side with a walk-in pantry with cabinets forward and to port. The pantry also leads to a mechanical space. 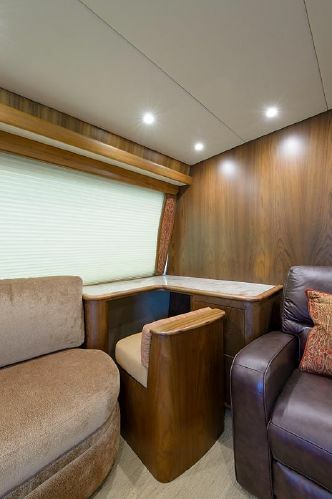 A large wraparound dinette has storage beneath it, and there’s seating for six to eight at a custom teak-trimmed, granite table with three large built-in storage drawers. 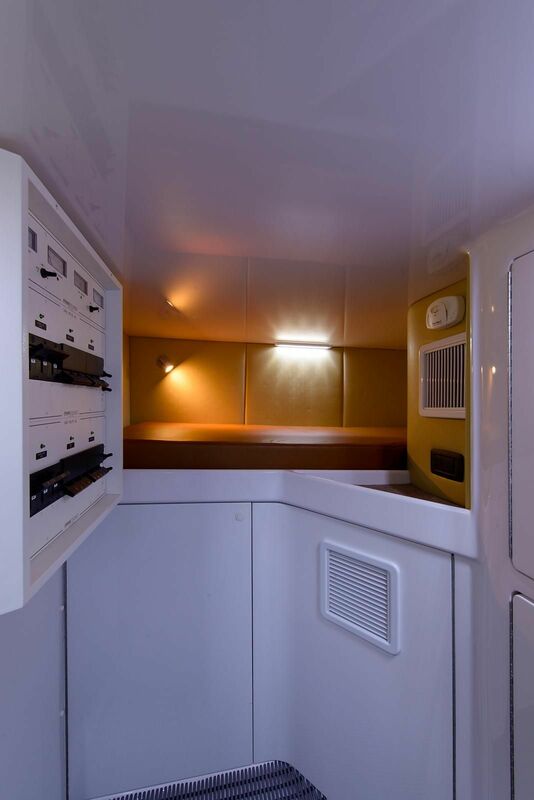 Large cabinets forward and overhead of the dinette offer even more storage. 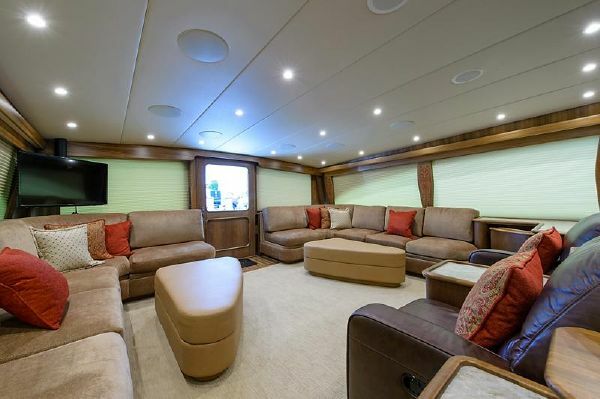 Entering the salon from the centerline door, you find two big leather lounge chairs with a giant 80-inch flat-screen TV mounted over them on a beautifully finished teak bulkhead. L-shaped settee lounges go forward on either side from each aft salon corner, ending with a built-in desk to port, forward of the settee. 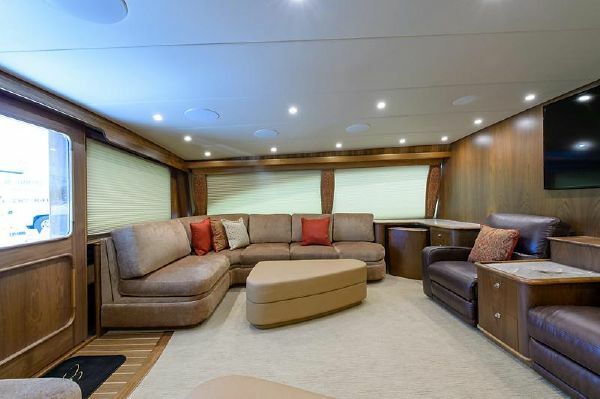 A bar with storage sits forward of the starboard settee and another flat-screen TV comes mounted in the aft starboard corner. 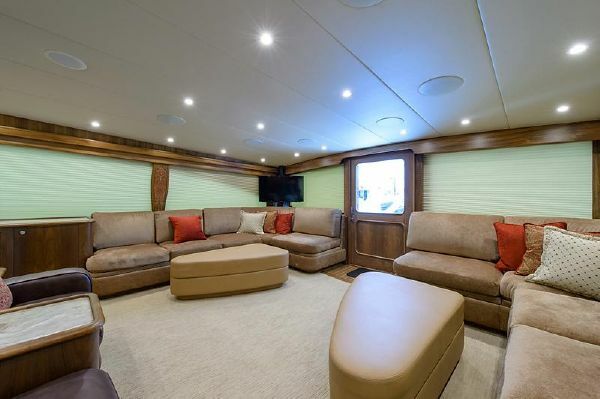 The owners take their entertaining and their college sports seriously, and the layout allows them to host a lot of folks without being on top of one other. 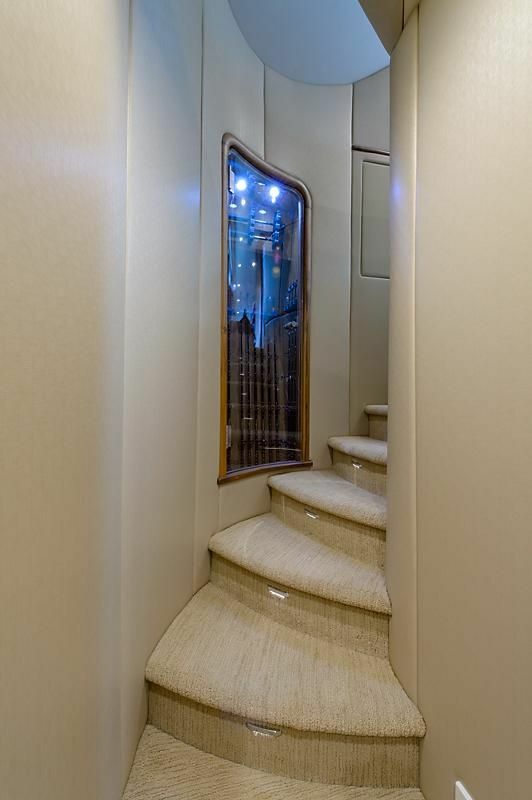 Heading below through the companionway along the starboard side, we discovered more storage space and a well-lit rod locker with a clear door. 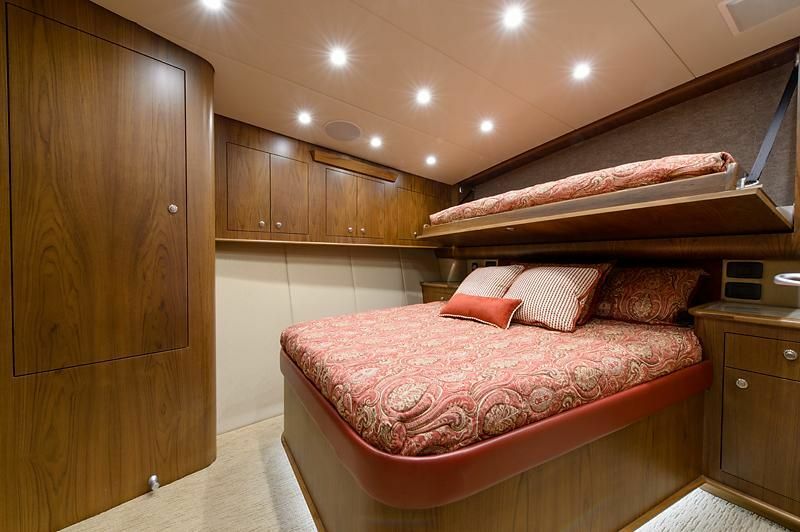 Once below at the landing of the stairway, a four-bunk stateroom sits to port with two over/under bunks, hanging -closets, drawers and a head forward of that. 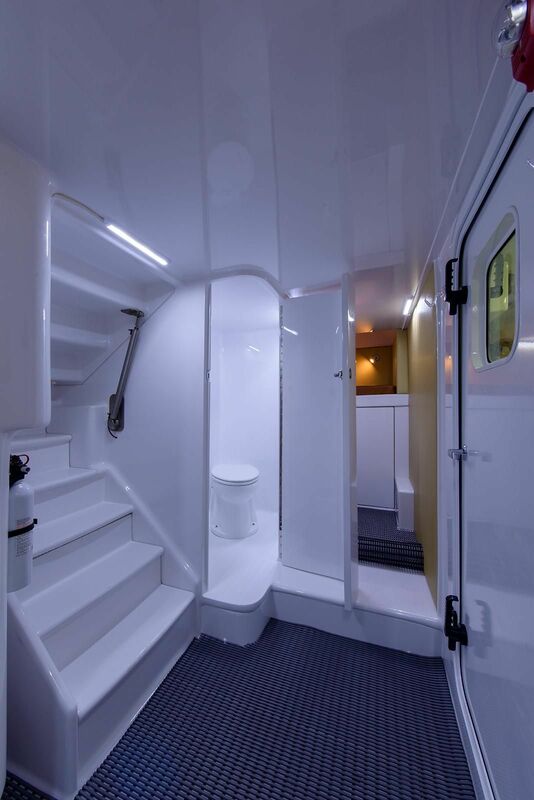 From the landing, turning aft, you enter the captain’s quarters with laundry facilities and head, just forward of the engine room along the starboard side. 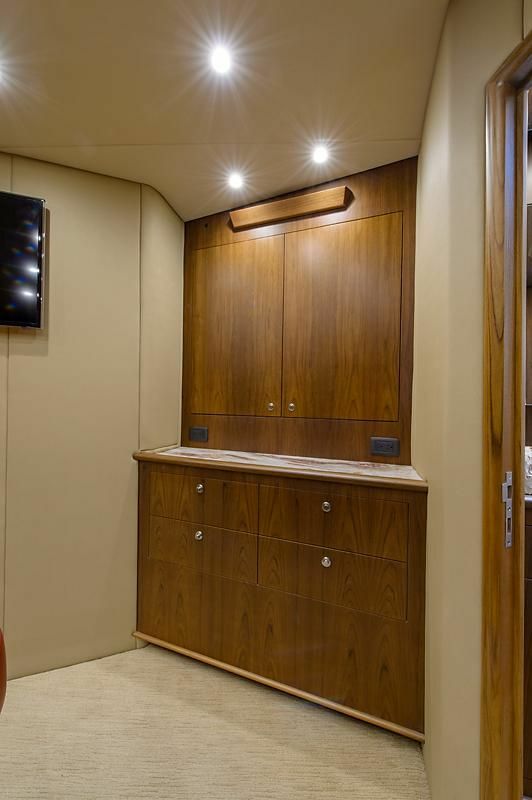 Moving forward up the companionway, a two-bunk stateroom with a private head lies along the port side and features hanging lockers, drawers and more storage. 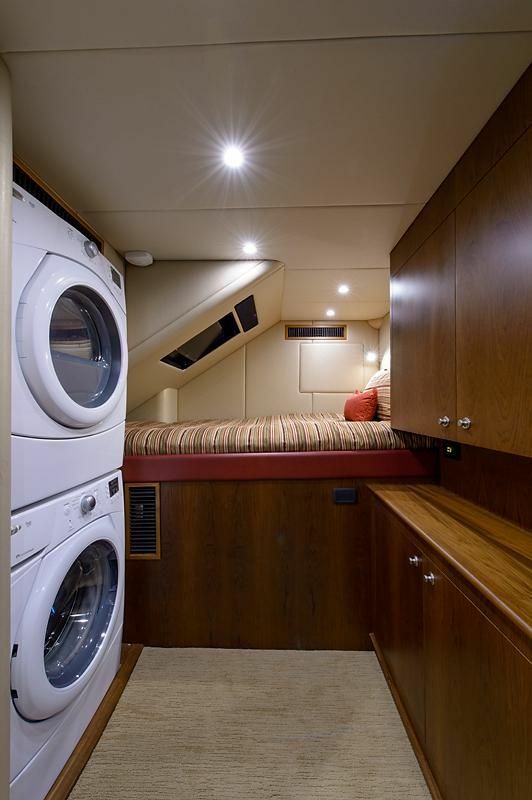 Across the companionway to starboard, a large VIP stateroom has a queen berth, a full-size, fold-down Pullman berth overhead, a hanging locker, drawers, overhead cabinets along the starboard side, and a full head with both a shower and a vanity. 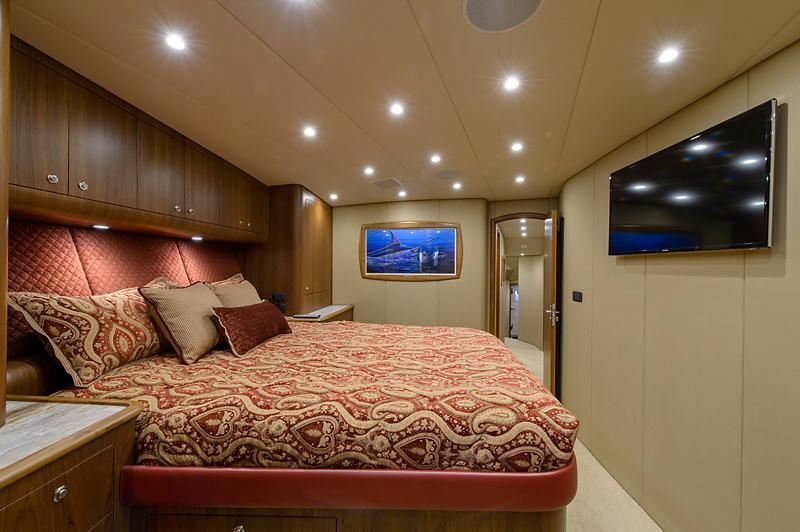 The master stateroom forward features an athwartship queen island berth with storage underneath and an access hatch to the cavernous storage space under the deck in the bilge. 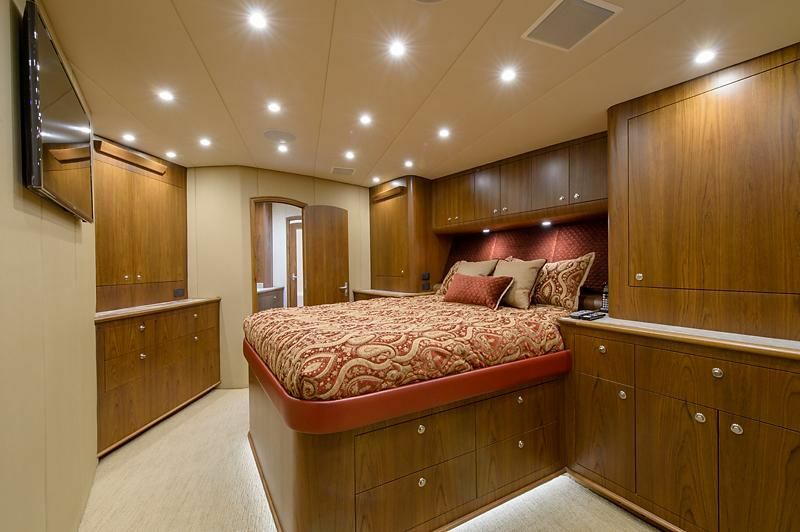 Large storage cabinets, a hanging locker, drawers, nightstands and a large head with the shower all the way forward make this master stateroom not only spacious, but very comfortable. 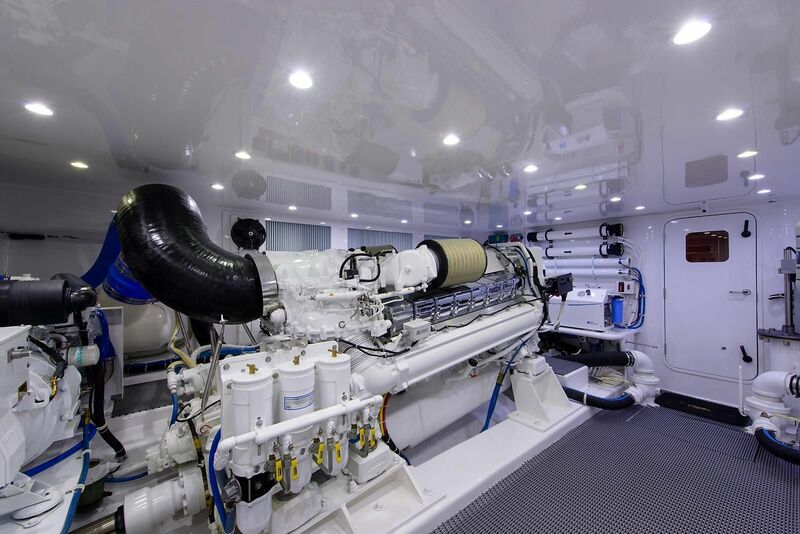 Under the salon, a sprawling engine room houses a pair of 2,600 hp MTU engines, two 34 kw Phasor generators, a Sea Recovery Aqua Whisper 1,200 gallon-per-day watermaker, a Spot Zero reverse osmosis water scrubber and the usual host of pumps, fuel-transfer equipment, batteries, and electrical system gear. 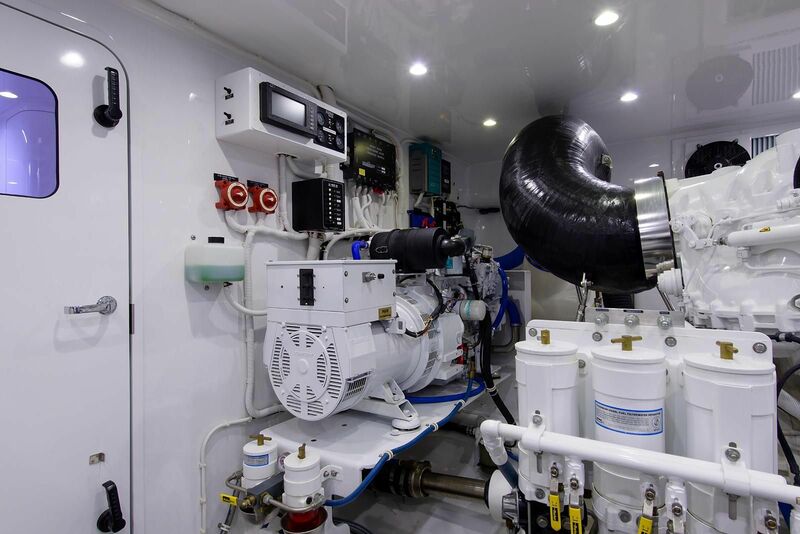 The open engine room features a well-designed layout, and all pumps, filters and equipment user interfaces are easily accessed for service and maintenance. Obviously, a great deal of thought and effort went into the engineering and implementation of systems. 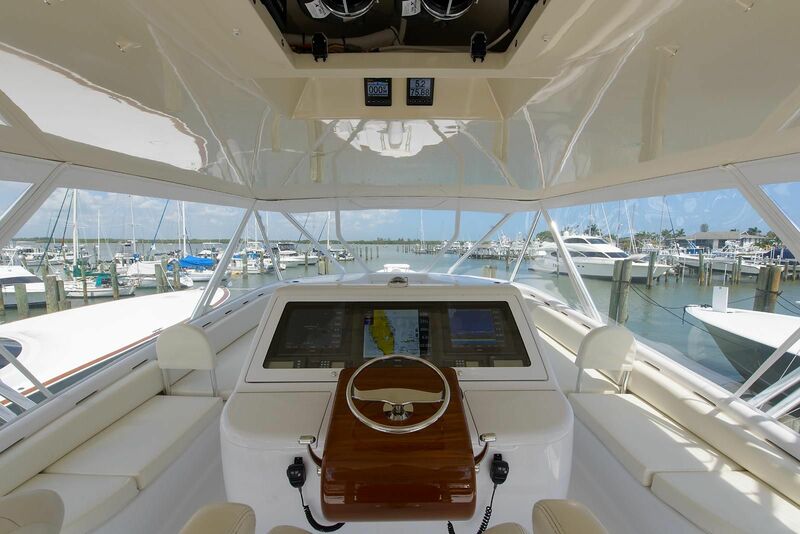 Owner personal effects, fishing rods, reels, gear, and tackle, Tender, EPIRB are not included in the sale of this vessel and will not convey at closing. Vessel Name Cannot Be Retained. 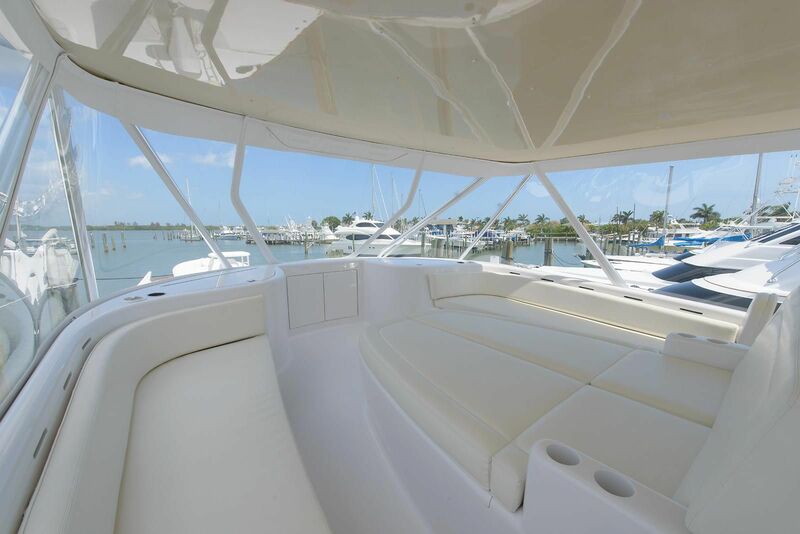 Blake Davis Yacht Brokerage Inc., provides the yachts for sale vessel description information contained herein as a convenience to this website user and does not in any manner warrant or otherwise guarantee the accuracy of such information. . Buyer assumes responsibility to verify all speeds, capacities, consumption’s and other measurements contained herein and otherwise provided and agrees to instruct his agent/s to confirm such details prior to purchase. 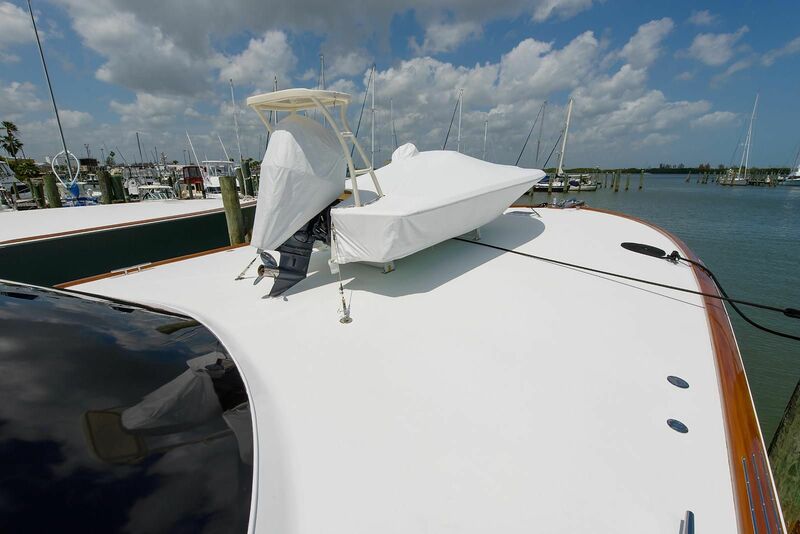 Vessels are subject to prior sale, subject to price and inventory changes and withdrawal from market without notice. 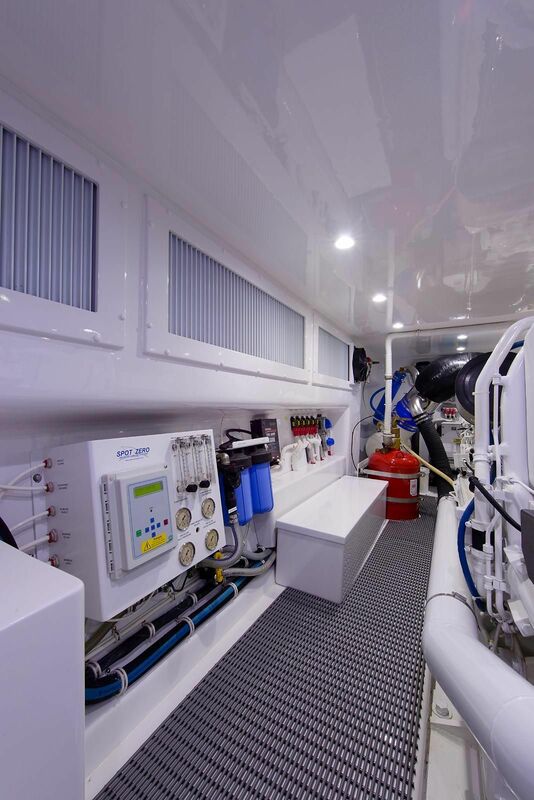 It is very inexpensive to hire a surveyor to go do a cursory “pre-survey” inspection of any yacht you are considering, and have him take detailed photos of the areas you wish to see more of before you go to the expense of traveling to see the vessel.